Successfully Added Watch MP4 Player 256MB, 1.5-inch OLED Screen to your Shopping Cart. NEW MP4 Player Watch - as featured on tech news all over the internet - the cool gadget everyones been waiting for. This is a digital watch with a 1.5-inch full colour video screen. 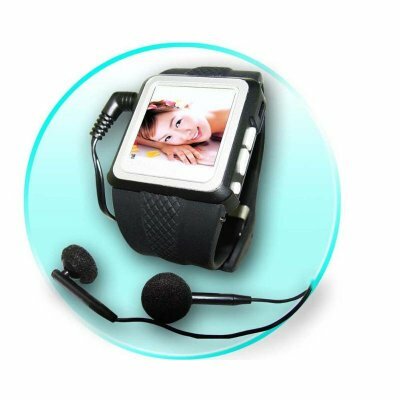 You can watch videos on your watch and listen to MP3 music. Browse your digital pictures and digitally record sound! Brand new, full retail packaging, accessories included in the box - a great product that you need to have in your catalogue. please specify the color(s) required using the comments box in the online order checkout process. Plays videos in full colour on 128x128 pixel screen. Impressive crisp, bright display. Plays MP3 and WMA music. Displays digital photos in JPG format. Voice recording with built-in microphone, and playback of your recordings. Flash memory can be used as removable PC data storage. You can view the watch or a picture while listening to music. Thin and light. Comfortable rubber click watchstrap. Earphones are supplied and plug into a 2.5mm jack in the side of the MP4 Watch. You can upload music and videos and pictures to the watch via USB from PC. A USB cable is supplies and plugs into a mini USB port on the side of the watch. The opening for the mini USB port has a built in microphone so you can record sound like a dictaphone. The watch charges via USB. The on-screen menu lets you choose the mode (music + video / clock / voice rec) or select different setup options.